The cool, rainy morning was a relief after a number of brutally hot and humid days. Not that the heat and humidity should have surprised us, this was Arkansas after all. 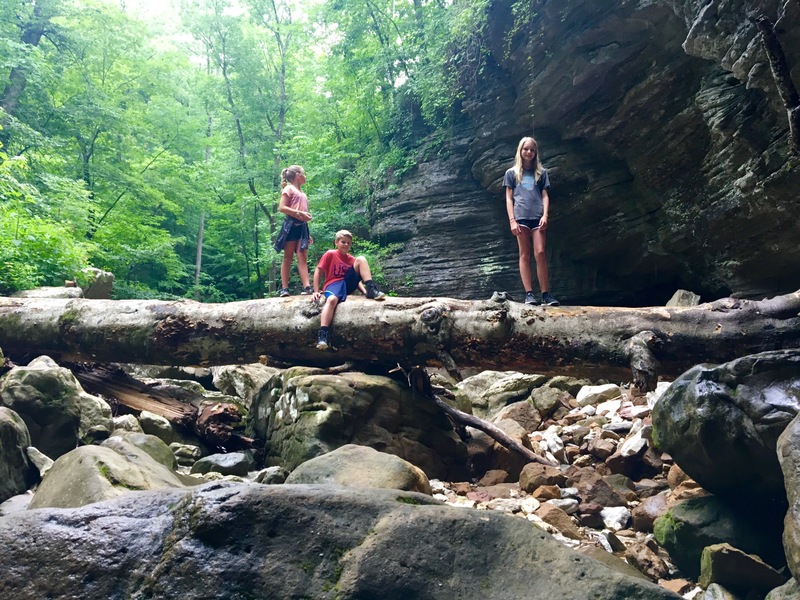 We had come to the Ozark Mountains for a long weekend of hiking and exploring. Crossing the Mississippi River in Memphis, we immediately hit the flat, fertile flood planes of Arkansas. Rice paddies (who knew?!!) 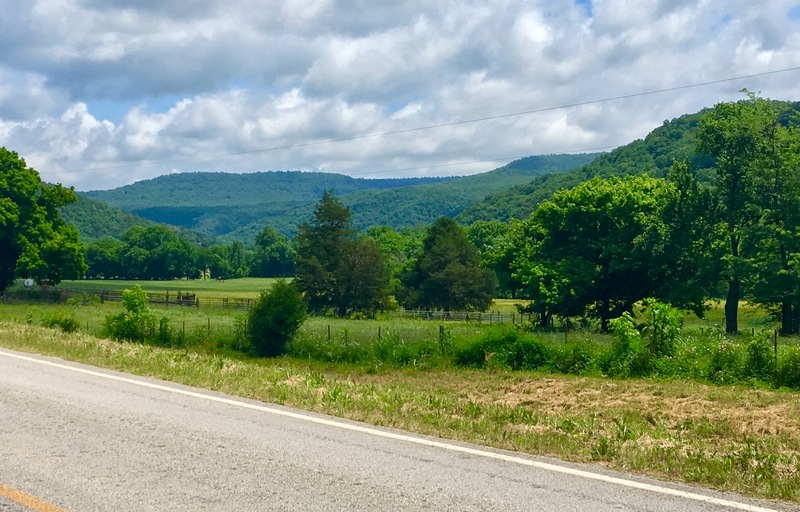 stretched out in front of us for miles and it was a long time before we entered the hills of the Ozark Mountains. Fields gave way to pines and the small towns grew further apart. The road curved sharply, climbing higher as we passed vacation homes clinging to the sides of the mountains. We stopped for gas at a station with an amazing view and a dog blocking the entrance of the store. He raised his head and looked at us with half open eyes as we entered, but did not move. The two women behind the counter, excited, it seemed, to have a customer, told us of a hidden waterfall nearby that they had just explored. The waterfall sounded great, but we had to keep moving. We reached our hotel just as storms rolled in and watched the rain fall in sheets from the dry safety of our room. The rain stopped mid-morning the next day as we drove through rolling farmland. A misty fog clung to the hills as we passed dirt roads leading to small farms set among fields filled with cows. It seemed hard to believe that there was a hike set among the farms, but soon we entered a lush hollow and saw the sign for the trailhead named, appropriately, Lost Valley Trail. 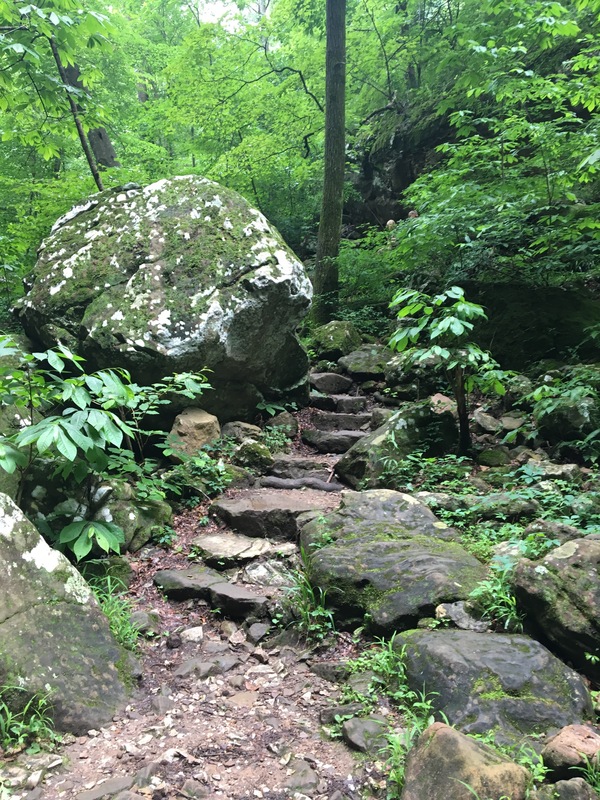 Lost Valley Trail, located within Lost Valley State Park, is a great hike that at just 2.2 miles R/T is accessible to anyone. It’s a popular hike, so the trail is often crowded. But the great thing about the hike, the reason we decided it was our favorite, is that it is so varied. There is just so much to explore on this short hike. The first half mile or so of the trail is flat and handicap accessible. 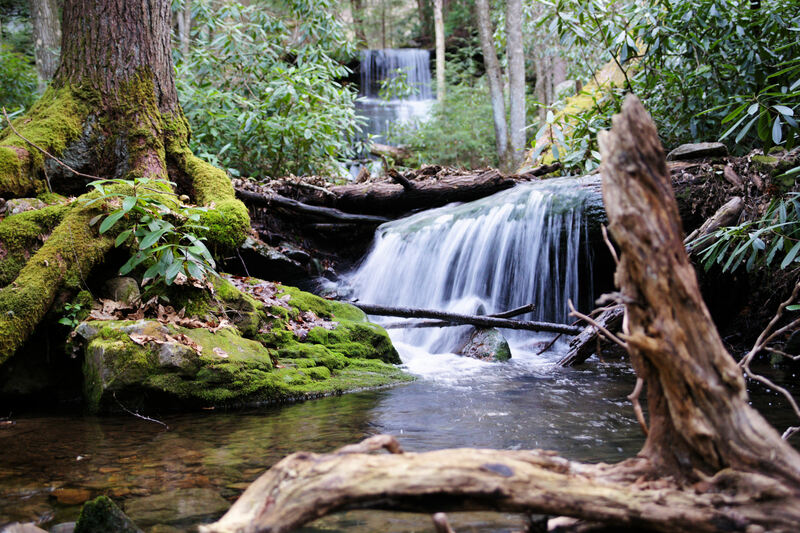 There are even a few benches to sit and rest and enjoy the cool quiet of a hardwood forest and the Clark Creek. After that the trail becomes less level and starts to climb some. The entire hike is through a box canyon which might have once all been underground. High bluffs surrounded us on both sides. 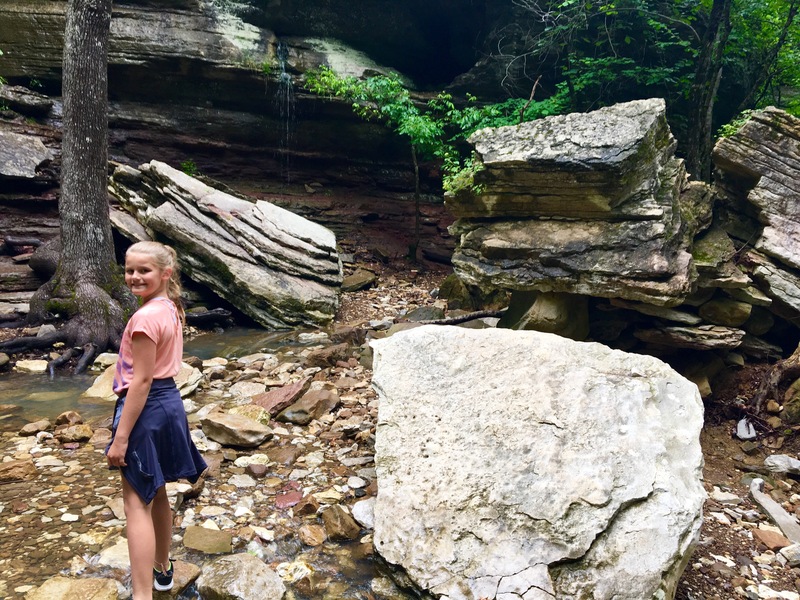 Many of the feature on the trail point to this, such as our first stop to look at massive stone blocks that fell long ago from the surrounding bluffs. We hiked some more and soon came to a natural bridge. Here the creek has carved through limestone to create an arch. The water was low enough that we were able to climb through the “tunnel”. The sun came out, rapidly burning off the remaining fog and the day started to heat up, so we stopped to rock hop and play in the creek. Our next stop on the hike was Cob Cave. 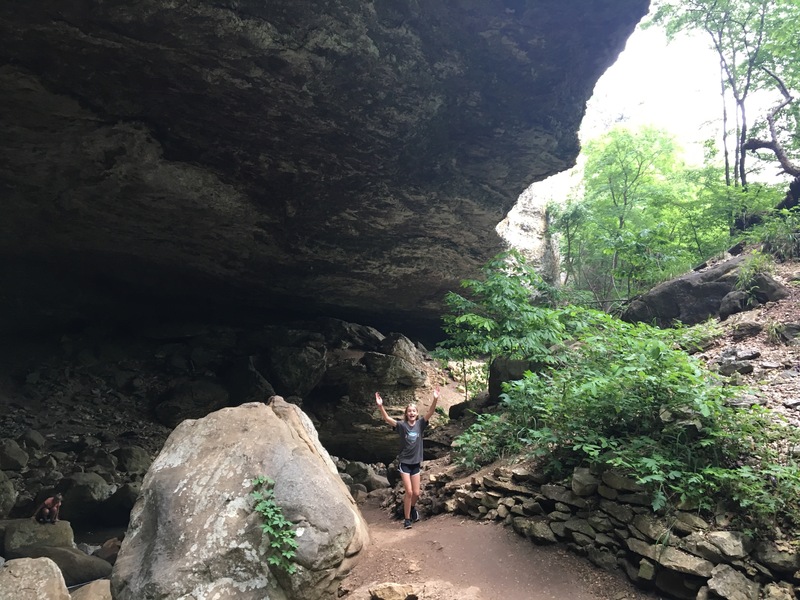 It’s not actually a cave, but rather a giant bluff shelter once used by Native Americans that gets its name from corn cobbs found on site. 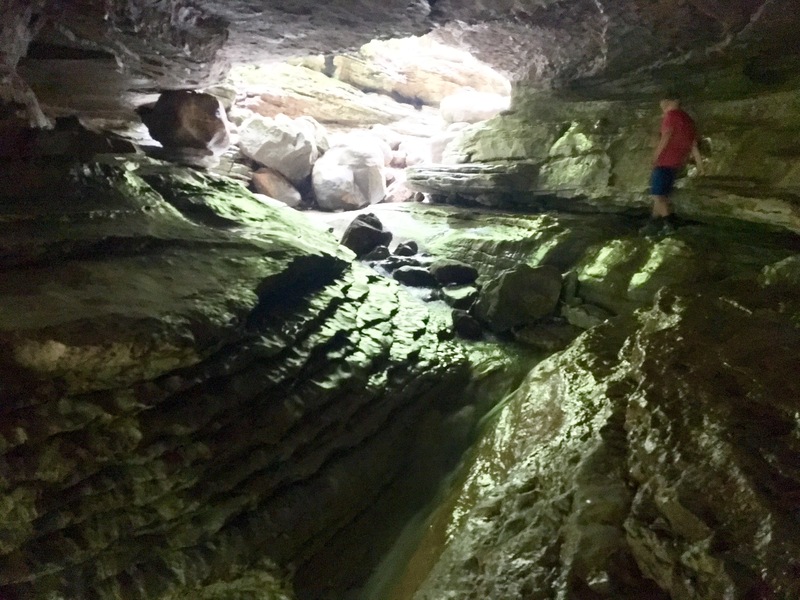 We spent some time exploring the cave and marveling at the sheer size of it. It was easy to imagine this being used as a shelter and place to stop and rest for the night. Stop number four on the hike was Eden Falls. It’s a series of four waterfalls that plummets 170 feet down the bluffs. The hike brought us to the base of the falls and then turned to steeply climb out, providing good views of the entire waterfall. The trail climbed some more, up a set of mossy stone stairs. They twisted around large boulders and disappeared into the green forest. Water from last night’s storm still dripped down on us as we stared up at the canyon walls. They surrounded us and made us feel very small. Lost Valley. Here, you could feel how the area got its name. Standing quietly in the forest, you had a sense of timelessness. Of the ancient hitting against the present; unchanged by time. It was comforting to know a place like this still existed! We hiked on, still climbing some until we reached the last stop of the hike; Eden Falls Cave. 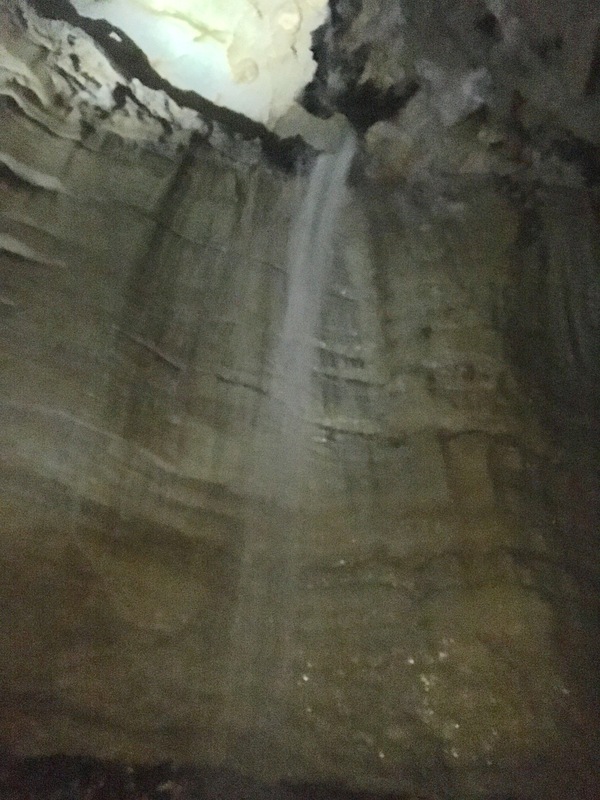 Water from Clark Creek flowed out of the entrance to a small underground cave. We crossed the creek and climbed up a ledge which the water flowed over, creating a small waterfall. Peering inside the murkiness of the cave, we were excited. It was time to go explore! The cave has been carved by the stream but there is still a good deal of dry land to walk on. We strapped on our headlights and began to walk back into the darkness. You definitely need a flashlight to explore the cave as it is very dark once inside. We decided to head to the left and soon were on our hands and knees crawling because the ceiling of the cave was so low. We turned to head out of the cave and realized that there was a narrow passage to our left that we could take that did not require us to crawl. It was so much easier! So, if you don’t want to crawl, take the passage to the right when you first enter the cave. You might need to stoop here and there, but will stay on your feet. We exited the cave, blinking against the shock of bright sunlight after the darkness of the cave, and crossed back over the creek to the trail. Eden Falls Cave is the end of the trail, so we headed back; a quick one mile hike out through the forest. The cool solitude of the forest was enjoyable and before we knew it, we had reached our car. This was a great little hike! Definitely a must do if you’re ever in Arkansas. I’ve included a link to the trail information and location below. Have fun exploring! Spring Break in New Jersey; where to go? Literally every one of my friends has gone to Florida (aka Jersey South). But no, not us. We decided to go to Pennsylvania. Yes, Pennsylvania! What, PA is not your first choice as a spring break destination? Okay, maybe not ours either, but we had an amazing time and discovered a beautiful, unique part of the state that we did not know existed! It’s known as the Pennsylvania Wilds. The area consists of 2 million acres covering 12 different counties in what I would consider north central PA. 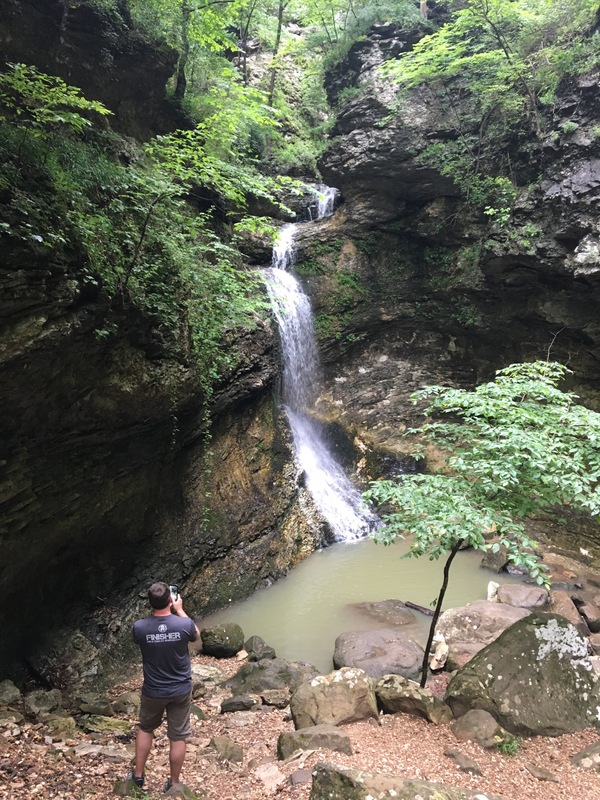 The area is full of state parks, rivers, bucolic green valleys, and hidden dirt roads crisscrossing the Allegheny Mountains. I love to explore areas that I have never been to; it really doesn’t matter where as long as it’s a new area. This year we knew we could not travel far, but did want to get away. So, after some research I came across the PA wilds, just 3 and a half hours from our home. I began to plan what we would do each day and stumbled across what became the best find of the trip. While looking at the various state parks in the area, I came across a page that listed the various places to stay in the parks. I saw the word “yurt” and immediately searched for availability. One of my dreams is to stay in a yurt, don’t judge! 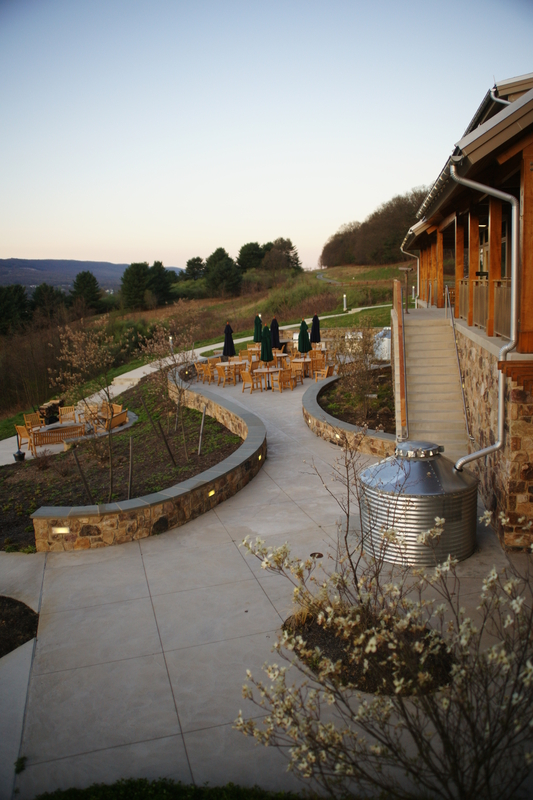 Well, the yurt was a no go (someday…), but I found something better, The Nature Inn at Bald Eagle. 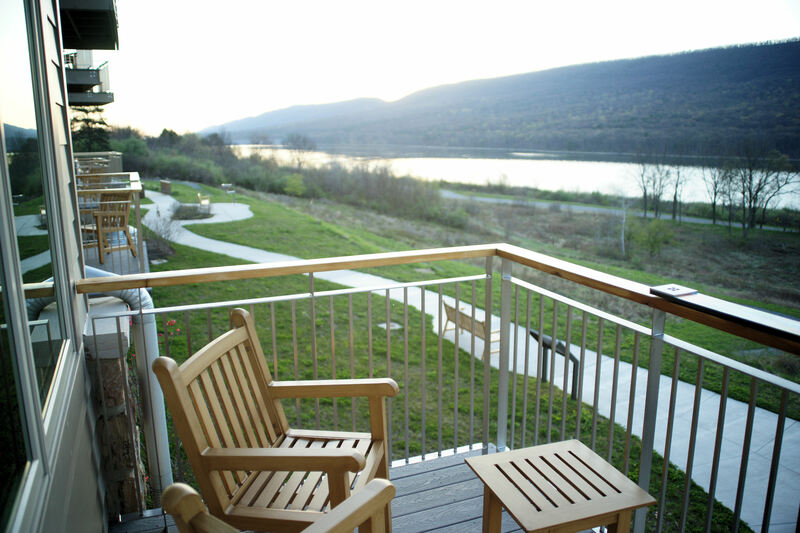 This is a 16 room “green” resort located overlooking a lake flanked by mountains in Bald Eagle State Park. The Inn opened just a year and a half ago and is the first of its kind in PA. Our room was a small suite with a balcony overlooking the lake. The room was spotless! My husband and I even had privacy, which usually never happens on a trip, because the queen sized bed was in a separate room (the kids slept on a pullout couch). The Inn is bird themed and has a lot of great extra touches such as binoculars in every room, various bird foot prints stamped into the walkways, neat displays of bird eggs and local finds, and a computer to log bird sightings. There are also great outside areas like the large covered porch with chairs overlooking the lake, multilevel patios with interconnecting walkways, picnic tables, and a fire pit. My husband’s eyes rolled when he learned that the hotel is promoted as “green”, envisioning stinky waterless toilets, cold showers, scratchy hemp bed sheets, compost barrels, and toilet paper made from recycled cardboard. Not to mention the degrading looks he thought we would get from all the hybrid car owners when we roll up in our 12 mpg Yukon. But none of that turned out to be true. Okay, he did say that the parking lot looked like a used Subaru dealer, but the green aspects were mostly behind the scenes and pretty interesting to learn about. We highly recommend staying here if you are ever in the area; it is such a unique spot! Despite how nice the Inn was, we are not the type to hang out at a hotel all day. We spent our days exploring the area. One day we drove into the Allegheny Mountains on a road that followed the meandering Susquehanna River though small towns and wild looking forests. Driving and hiking to the tops of these mountains provided amazing views of mountain after mountain sharply receding down to meet the crystal clear shallow river. The tiny towns interested us as well, it is difficult to imagine living in a town that isolated! Later that day we decided that we were finished with touristy overlooks on paved roads, it was time to do some real exploring! We headed into the “black forest”, as this part of the forest is referred, due to its wild untouched quality on a dirt road. Yes, we were only two hours from sunset, but we couldn’t resist! The drive was a bit wild (you need a 4 wheel drive!) but so beautiful. The road traveled up the mountains with nothing but a sharp drop off on one side of you then down into valleys with rhododendron lined creeks rushing into the Susquehanna somewhere far below! As we headed further and further from the main road and climbed up to the top the mountain, we started to pass camp after camp after camp! Little cabins, hunting lodges, and weekend getaways nestled deep in the forest. It was work to get back here! These were true retreats. We finally stopped near one such camp to hike to our destination. Our hike would not be far, but we were nearing sunset. Of course, this did not stop us! We piled out of the truck and began a quick hike down into a valley, following a little stream the entire way. The hike was beautiful! Large pines mixed with rhododendrons bordered the moss and stone covered path. The creek flowed down over boulder after boulder creating numerous mini waterfalls and a delightful noise. We reached our destination, 3 Falls, a beautiful three-tired waterfall! My husband got to taking pictures while the kids climbed all over the falls, including behind it! 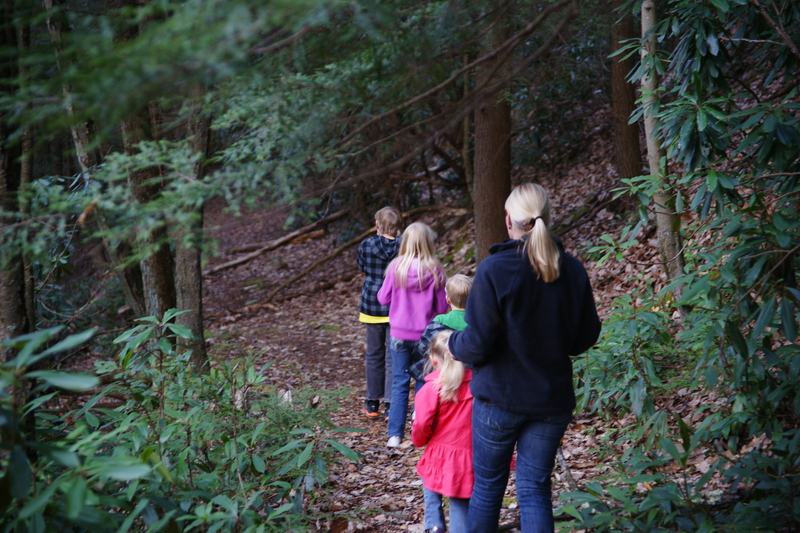 Soon we noticed that darkness was quickly falling, so I gathered the kids and began to head back up the trail through the now murky woods. My husband stayed behind to take more pictures. Time stands still when he photographs, so I really wasn’t sure when we would see him! We made it back to the truck and waited ten minutes or so, straining our eyes into the darkness to look for him. Soon, he came running out of the woods. He had lost track of time! Thanks to our gps, we drove off the mountain without incident, back to our hotel. Dirty and tired, we knew we had managed to squeeze everything we could out of the day!